Well, I announced earlier this week that I’m doing a Justice League fanfic entitled ‘Justice League Infinite’. As such, I’m going through all seven members of this world’s League, what makes them different from their counterparts, etc. So far, we’ve looked at Batman, The Flash, Poison Ivy, and Superman. 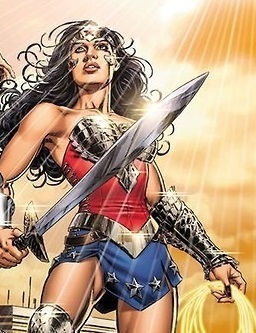 So, for today, let’s go ahead and take a look at this world’s version of the Spirit of Truth, Wonder Woman. Origin wise, this version of Diana of Themyscira is pretty much the classic sculpted-from-clay story. Not that I have a problem with Wonder Woman being a demigod, just that it taints her back-story in a bad way. She also has her sister, Donna, who is a mirror duplicate of herself as a child and a possible inheritor to the Wonder Woman title, AND THAT’S ALL. lol What’s different is that, not only was her mother Hippolyta the first Wonder Woman on the Justice Society (an idea that’s been tossed around on occasion), but recently, Hippolyta and Aquaman were tricked into entering a fight to the death, which was witnessed by Diana and Mera. As a result of that, and as a means of keeping their respective peoples from declaring war on each other, Diana and Mera married, becoming co-Queens of each other’s lands, and thus uniting the people of Themyscira and Atlantis (meaning Themyscira is no longer a land bereft of men). Of course, the two were already close friends, thus making their relationship a bit interesting now that they’re wives. In terms of personality, Diana is a compassionate, loving soul, but while she will try to negotiate her way out of a confrontation, she will fight with the ferocity of a lioness if necessary to protect the weak and defenseless. Likewise, while she will not bring death to humans, she has no such compunctions for demons, monsters, undead, and some aliens. 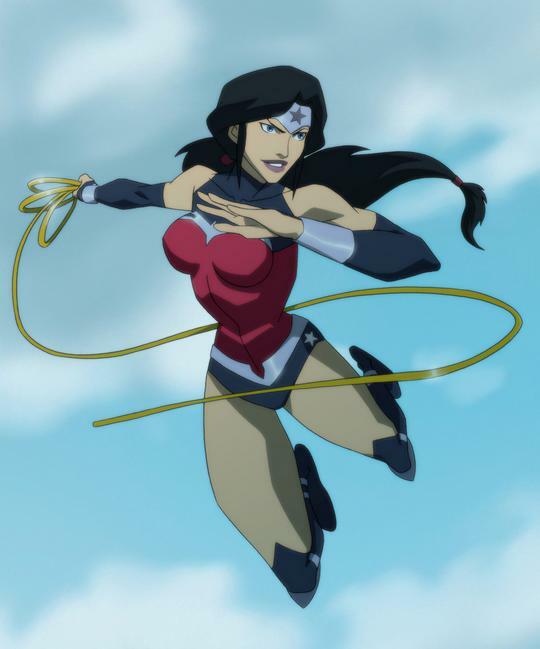 Regarding Wonder Woman’s costume and appearance, take her Earth 2 costume in the New 52 (only with gold replacing all the silver and red boots instead of blue), give her chest coverage that her Justice League War costume had and the ponytail (because I LOVE it, lol), and a red cape like she’s sometimes seen in on some of her more diplomatic missions. As far as her skill set goes, she has her usual package of super strength, speed, reflexes, durability, and stamina, tracking skills, and is a master of both unarmed combat and wielding a shield and sword. She’s also a highly skilled diplomat and negotiator, meaning that she can oftentimes avoid ever having to use such gifts in combat by putting an end to conflict before it ever even begins. She can also fly fast enough to keep up with Superman, but as a means of reserving energy, she mostly prefers to fly on the back of a pegasus. As always, Diana wields the unbreakable Lasso of Truth, which forces one to reveal their true nature, tell the truth, and even free them from brainwashing or other types of control. Finally, she has the Bracelets of Victory, which guard against all forms of attacks. When the bracelets are removed, however, most of her natural abilities increase to ludicrous levels, the likes of which even Superman cannot contend with. For all of these abilities, though, Wonder Woman isn’t invincible. Her stamina, while incredible, does have limits, meaning she will eventually tire out if a battle runs for too long. Also, while removing her bracelets doesn’t cause her to go into a berserker mode like in the comics, it DOES put a huge strain on her body. Just a couple of minutes is long enough for her to be ready to pass out in this state. Finally, while her compassion is a great gift, it also comes coupled with a sense of self-sacrifice, constantly causing her to put herself in harm’s way to protect others. Granted, she more often than not walks away without being too harmed, but when you consider the possibility of her leaving Themyscira without its Queen…well, hindsight is 20/20. …So, that’s all there is to know about Infinite Wonder Woman, but what about her new wife? 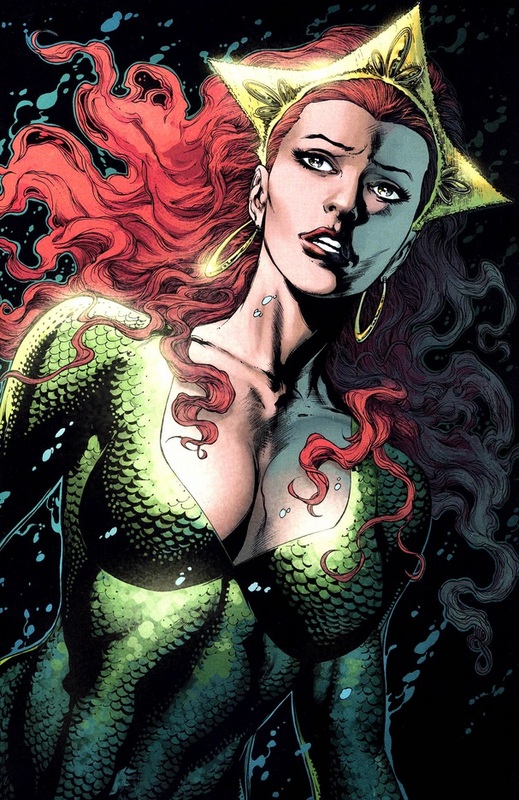 Granted, she won’t be joining the Justice League, but she will be making an appearance or two, so let’s look at Mera. Again, Mera is very similar to the mainstream version seen in the comics: A princess/assassin from another dimension sent to kill Aquaman, but instead fell in love with the King of Atlantis and married him. She’s also become somewhat of a surrogate mother to Jackson Hyde, AKA Aqualad, due to his estrangement from his father, Black Manta. In this universe, she’s also a close friend to Diana, and accepted her proposal to get married for the sake of their friendship and their peoples (which is quite the twist from Flashpoint). While kind and loving, she is also known to fly into fits of rage when wronged. You know the old saying “Heav’n has no rage, like love to hatred turn’d, nor Hell a fury, like a woman scorn’d”? If William Congreve had lived in today’s society, he likely would’ve been talking about Mera. And yeah, I know, it can be something of a sexist comment, but it’s most certainly true of Queen Mera ‘Don’t You DARE Call Me Aquawoman’. While she understands that she SHOULDN’T kill, she at times has difficulty keeping the desire to in check. Mera is more or less exactly like the mainstream version of her in both appearance and powers. Like Aquaman, the Queen of Atlantis is perfectly capable of surviving in a kingdom at the bottom of the sea, meaning she has the strength, durability, and enhanced sight of someone who lived in a place so dark and having such constant pressure put on her. She’s also an extremely fast swimmer, and possesses a leap out of the ocean measuring at approximately 1000 feet. 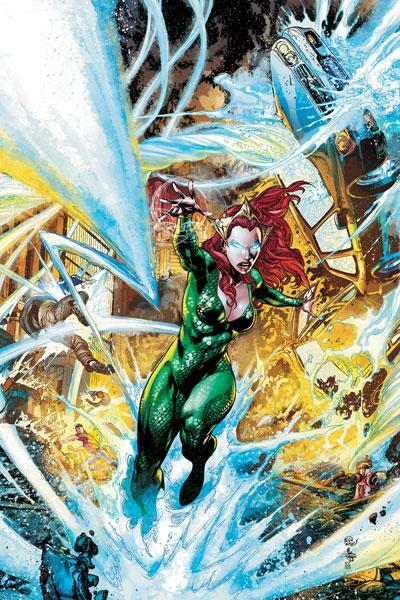 Mera also possesses telepathy, able to send messages to someone’s mind and receive replies, though she lacks skill in terms of digging deeper into a person’s thoughts. Her trademark ability, however, is her skill in manipulating water. She can shift water around to her will, form hard water weapons, and launch concussive blasts. Also, get her REALLY mad, and she could conceivably warp the water molecules inside of someone to hurt them from the inside. Ultimately, her greatest weakness is her anger, as it can blind her in combat and cause her to make mistakes. Also, while she’s durable enough that bullets would only scratch her skin, she is by no means invulnerable. Anyway, that’s it for Wonder Woman and Mera. Next time, we wrap up our look at the Justice League Infinite with Green Lantern and Doctor Fate. Ja né! So, as announced earlier this week, I’m doing a Justice League fanfic entitled ‘Justice League Infinite’. As such, I’m going through all seven members of this world’s League, what makes them different from their counterparts, etc. We’ve already looked at Batman, The Flash, and Poison Ivy, so let’s go ahead and take a look at this world’s version of arguably the greatest superhero of all time: The Man of Steel, Superman. So yeah, you’ve probably noticed one or two things different about this Superman. 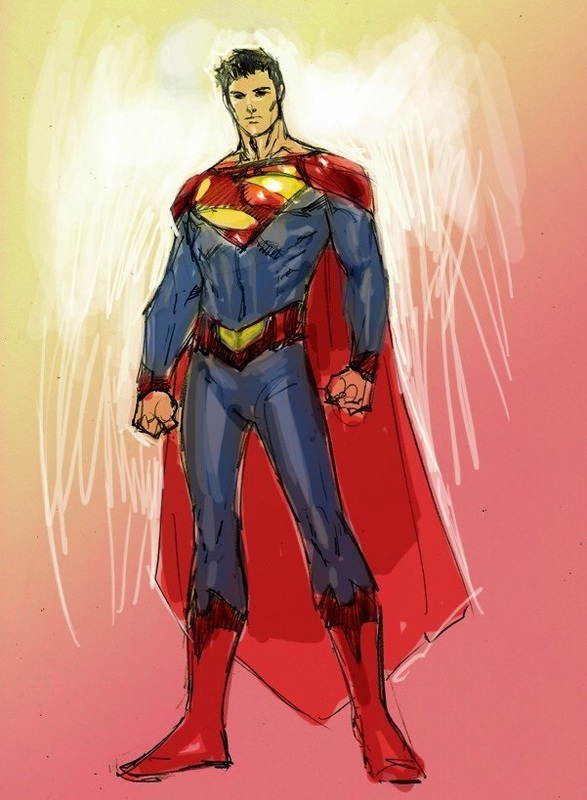 He’s based off of and borrows elements from a few different characters in addition to the mainstream Superman. In this universe, he’s Calvin Henry Kent, born Cal-El on Krypton. His home world was destroyed due to damage done to the planet’s core by Brainiac, who had miscalculated when he tore the capital city of Kandor free (because in every other continuity, the people of Krypton come off as very stupid for not seeing the end coming). 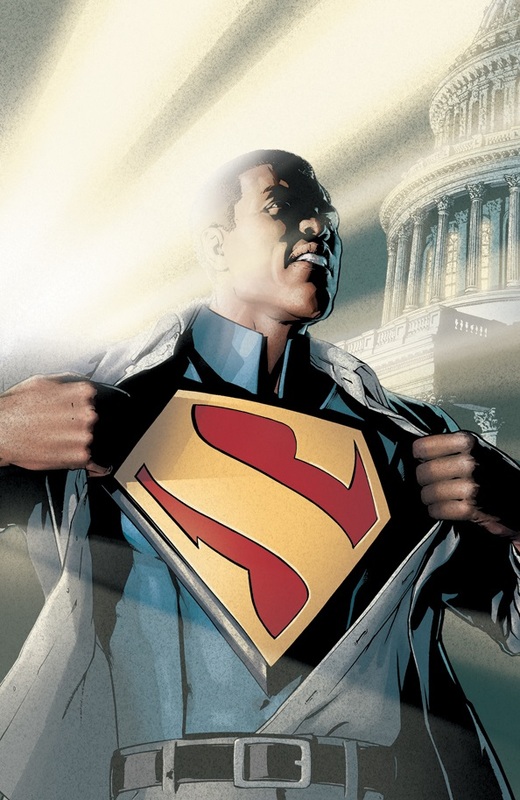 Calvin works for the Daily Planet, as the lead columnist for the company’s online blog, though he actually lives in Smallville with his adoptive parents, and his childhood sweetheart and colleague at the Daily Planet, Loana Lane (basically, an African-American hybrid of Lois Lane and Lana Lang), who learned of his secret growing up. As Superman, he’s looked up to and admired by the people of Metropolis, though his efforts are oftentimes marginalized and hampered by President Lex Luthor. 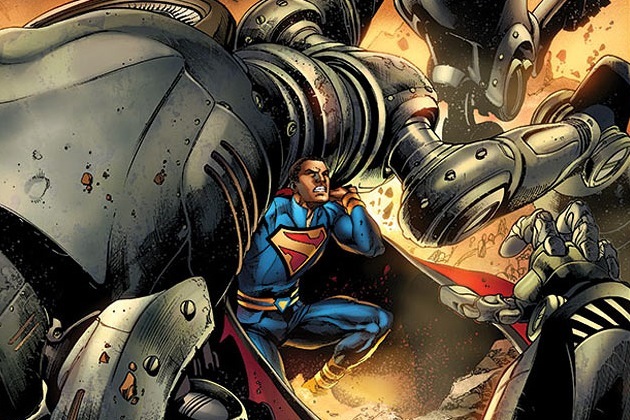 Like Calvin Ellis of Earth 23, he fights for truth, justice, and equality, and while he isn’t strictly a pacifist like Val-Zod of Earth 2, he will try to avoid a direct, physical conflict whenever possible. And of course, as anyone who bears the name Superman should be, Cal is kind, noble, and courageous. He inspires others through his actions to be better than they are, and while he’s not immune to making mistakes, he will always strive to do what he believes is right. Let’s talk for a second about the costume. It’s pretty much the costume Earth 2 Superman of The New 52 wore, only the House of El emblem more resembles the one on Calvin Ellis’ costume. The cape also has a yellow Superman logo on the back as well, and the blue of the costume has a bit of a silver tinge to it (in reference to Steel). And, as is traditional for Superman, it’s almost always worn under his usual clothes so that he can quick-change into the Man of Tomorrow whenever necessary. Now for his powers, which is always an interesting topic when it comes to new takes on Superman. Cal possesses a pretty good portion of the typical Superman’s physical strength, durability, stamina, and speed, but he has yet to tap into the full extent of what he can do while powered by Earth’s sun. He also has his x-ray vision, but he hasn’t figured out heat vision yet, and while he has his super breath, he can’t use it to freeze whatever it touches at the moment. Otherwise, he is perfectly capable of flight, has his other super senses, can process information at speeds impossible for an ordinary human, has mastered voice mimicry and ventriloquism, can breathe in space, is highly adept at using pressure points in combat, and is currently studying two Kryptonian martial arts: Torquasm-Rao, which allows him to enter the real-life Theta state, and Torquasm-Vo, which grants him the ability to protect himself from illusions and mind control. His weaknesses include the well-known Kryptonite, which severely weakens his body and cancels out the solar energy stored in him, and most magic-based attacks and enchanted weapons. Otherwise, the only way to beat him is to outlast his supply of yellow sun energy, something that only the most powerful of opponents can do. And that’s about it for Superman. Next time, we take a look at Diana of Themyscira, as well as a certain character related to her in the fanfic who, while not a member of the Justice League, will nonetheless make an appearance. Ja né! So, as I announced before, I’m doing a Justice League fanfic entitled ‘Justice League Infinite’. As such, I’m going through all seven members of this world’s League, what makes them different from their counterparts, etc. As such, let’s take a look at this world’s version of The Fastest WOMAN Alive, The Flash. As you can tell from the above photo, this Flash is heavily based off of the superheroine Jesse Quick, a favourite of mine to be honest. In this universe, Jessica Garrick is the daughter of this world’s Jay Garrick, AKA the Golden Age Flash, and once served as Kid Flash. However, an accident during a battle with The Rogues resulted in Jay’s death, after which, Jesse took up the mantle, protecting Keystone City from crime. Like Jesse Quick, she is extremely goal-oriented and even runs her own company, though she also has a more thrill-seeking side to her that constantly wants out of the office and fighting criminals. She’s also taken up various extreme sports, has a pilot’s license, and even flown shuttle simulations. However, the death of her father has left a dark imprint on her mind, as Jesse also harbours a deep, personal grudge against The Rogues, blaming them for the death of her father and having little in the way of patience for their antics. Still, she is far from a being a brooding loner, and of the seven heroes on the mission to save Earth, Flash is the one most eager and adamant about starting a group, believing them to be the inheritors of the Justice Society’s legacy. She also has a hyperactive little brother named Bart (based off Bart Allen), who is also a speedster and wants to take on the role of Kid Flash, much to Jesse’s occasional annoyance. 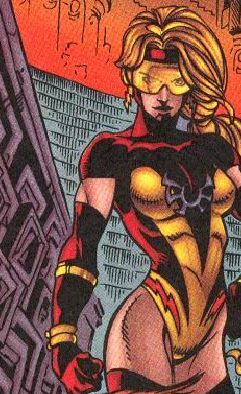 The Scarlet Speedster of Earth Infinite wears a costume almost identical to Jesse Quick’s from the earlier issues of The Titans, only that it bears the logo of The Flash. Also, the visor she wears comes equipped with an LED display that allows her to keep constant track of her surroundings and approaching obstacles or individuals. 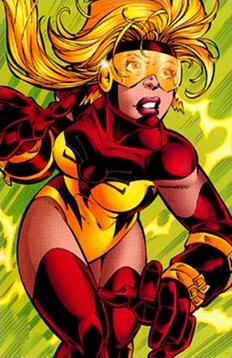 Naturally, as The Flash, she possesses superspeed, able to shatter the sound barrier with ease, and has the ability to process information like a super computer. She can also phase through solid objects by vibrating her body at just the right speed, create whirlwinds, and even sustain flight for a few minutes if she launches herself upward at the right speed and angle (an ability unique to herself and her counterpart from other Flashes). The best way to counter her in combat is to out-think her, as anyone who can predict her movements can adapt and bring her down regardless of how fast she’s moving. Anyway, that’s it for The Flash…BUT, because I feel like giving something extra (and getting all these done before Friday, when Pokémon Omega Ruby comes out and takes up all my time, lol), let’s talk about someone I would LOVE to one day see on the Justice League for real: Poison Ivy. 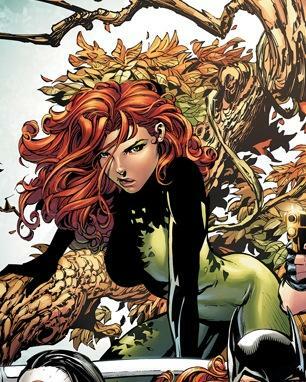 After she was seduced by Doctor Jason Woodrue and used as a guinea pig in his experiments, for which the doctor was able to avoid being brought to justice, Pamela Isley took on the identity of Poison Ivy and decided to dedicate her life to helping those that the law and the governments of the world couldn’t or wouldn’t help, whether those in power like it or not. Pam has a slight case of S.A.D., or Seasonal Affective Disorder. She can at times be a bit violent, even ruthless against those that harm others, but she’ll relent when asked to. She also has a particularly soft spot for children, especially orphaned or otherwise estranged children. As such, in this universe, it’s Pamela who discovers Garfield Logan and gives him a home when most of the world shuns him, and in turn, his more jovial side helps her to look on the light side of life. Poison Ivy possesses a connection to The Green, allowing her to commune with and control all plant life on the planet. 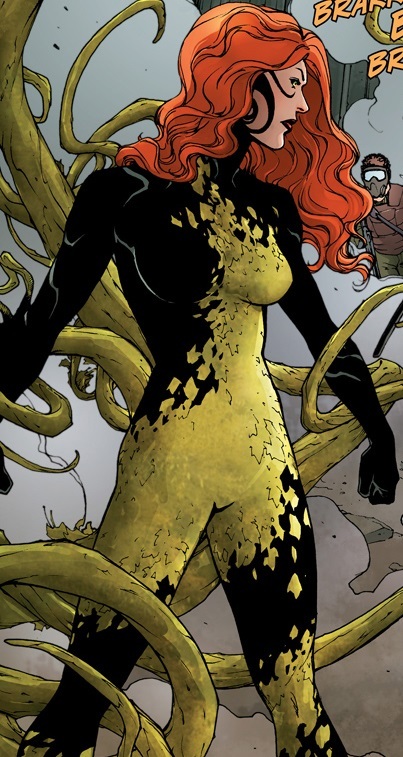 As her costume (lifted from The New 52) is laced with vines, leaves, and other forms of plant-life, this makes it a living entity on its own that can be used as a weapon, binding and whipping foes from a distance. She can even ensnare her own body in hardened bark to protect herself, or to improve her strength in attacks. Pam is also immune to all venoms and toxins, is highly resistant to mind control, and can even pass her consciousness along into a plant-based avatar. Finally, the Queen of The Green can use various powders and chemicals meant to paralyze, knock out, or otherwise incapacitate foes, and even force them to tell her whatever she wants to know. However, Ivy does have a massive weakness: Because she can hear the voices of all plant life, their cries of pain could distract her and cause her to lose control of her powers. Also, she’s highly vulnerable to ice based attacks and fire. Still, she is a proven survivor who will go to any lengths to preserve and protect.